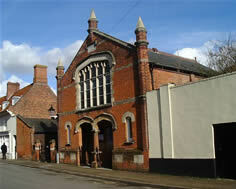 A red-brick chapel built in 1900 with a school room attached. Features a modern kitchen and toilet, including disabled facilities. Fortnightly there is a Bible discussion group on Monday Mornings 10am to 11:15am. 1st Saturday of each month there is a coffee shop morning, with market stalls. Collection Point for Plastic Tops and Lids supporting the Matthew Project.